Cal Orck'o: Footprints of time is part of the Tentative list of Bolivia in order to qualify for inclusion in the World Heritage List. Finding myself in the beautiful WHS city of Sucre, I thought it would be a terrible waste to not visit the footprints at Cal Orck'o when they are so close and easy to access. We jumped on city bus 4 from about a block away from the central market and followed a winding route through town until it ended right at the entrance to the cement factory. The factory is still going strong (though the guide at the museum expressed hope that it would eventually be shut down) and if not for the fact that I could see the museum entrance inside, I would have been hesitant to walk around the busy cement trucks and in through the chain-link fence. Looking at the "wall" of footprints from outside the museum is nearly as good as from the inside. Bring binoculars if you don't want to rely on theirs being in good working condition or don't want to go inside. Or better yet, show up early enough for the 12.00 or 13.00 guided tours that walk you down right to the wall for a closer view. We didn't show up until later in the afternoon so unfortunately missed this opportunity but looking back it would have been the redeeming feature worthy of the price of admission. The museum itself had a few info boards and you can opt to take a free guided tour around but was mostly a park full of models with very few actual fossils or artifacts to admire. The guide was helpful in pointing out which tracks were from which dinosaur though. I have my doubts about its future inscription (though can't understand why it couldn't be considered important enough) because of the ongoing damage concerns. You can easily see where the wall has collapsed in places and the footprints continue to get weathered and lost. Maybe an inscription and infusion of money can help preserve such a remarkable piece of history. Still a worthy detour as it was very cheap and simple to do and recommended for anyone with a couple extra hours in Sucre. Having made my way up the hill to see the dinosaur steps at Cal Orck'o I found myself in front of a closed museum door. As so often before; I really need to work on my travel itineraries. Now I had come to understand that even without the museum offering some context information you would be able to see the site. I was standing at the museum gate on a platform and all I could see were plenty of trucks driving in and out in what to me looked like a usual quarry, a pretty busy one at that. I was about to climb the fence hoping to get a better view of those dinosaur steps around the corner on the quarry edge (picture). But then a local teen intervened and was so kind to give me a short tour of the side. Indeed, I was already seeing a major part of the site from where I was standing. The seemingly random holes I was seeing on the other side of the quarry were those fabled dinosaur steps. Originally, the steps had been on the ground, but tectonic shifts had turned this 73 degrees upwards. 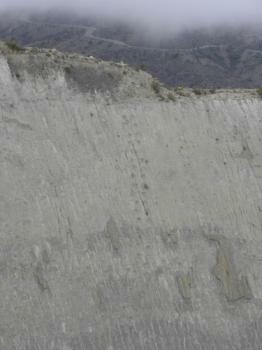 The footprints were found due to work in the quarry. Looking back millions of years to see the footprint of dinosaurs is plain amazing. So I would encourage you to make the small detour if you happen to be in Sucre anyhow. However, as long as the site is used as an active quarry I doubt that it stands any change of inscription. In addition based on Els comments IUCN doesn't like these sites. Not sure why. I am sure, though, that the concrete factory was still in operation end of 2017. The museum itself seems more of a dinosaur park, but may give you a fuller picture of the site. There is a bus running up the hill. I was not able to find the proper bus stop in the city center, though, and eventually settled on taking a cab. The site itself is a quick visit, so I had the cabbie wait for me for the return ride back to Sucre. Prices were very reasonable. See my comments on Sucre. I will always fondly remember the drive to the airport of Sucre in the highlands. The Cal Orck'o (Quechua for “Chalk Mountain”) is one of three dinosaur track-sites that are competing for WH status. In 2009 I had already visited one of them, the Dinosaur Ichnite sites in northern Spain. A disappointing visit, as the tracks there are very difficult to distinguish. 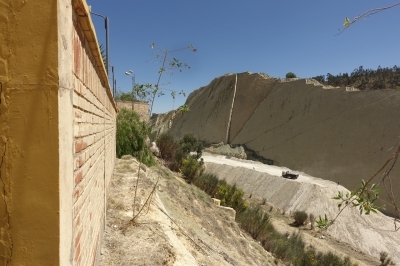 This site near the Bolivian capital Sucre however is the biggest in its kind. Over 5000 imprints and 462 trackways from various different animal species have been found. They were discovered in 1994, when they were exposed by erosion on a wall disused by the nearby cement factory. The wall is 1500 meters wide and 130 meters at its highest, and contains 7 layers of track and fossil sediments. They are 68 million years old. This location used to be a shore of a former lake, where the animals left their imprints in the mud. I got there on the touristy “Dino-truck”, that leaves three times a day from Sucre’s main square. A return ticket costs 17 bolivianos, entrance to the site 30 and another 5 for bringing your camera – so 52 bolivianos (5,20 EUR) in all, quite a European price. When you arrive after about 20 minutes driving from the center of Sucre, it looks like you’re entering the adjacent huge cement factory. The wall with the imprints is impressive as well: one almost flat surface, as if a mountain is sawn in half. I went up right away to the viewing platform, from where you can study the wall with the tracks which is on the other side of the former quarry. Fortunately the tracks are well visible with the naked eye, they run across the whole wall. There’s also an audiovisual room on site where they show dino-documentaries (not directly related to Cal Orck’o), and a small museum where you can see some footprints in close-up. And of course there are the obligatory colourful lifesize dinosaur-models that you see at dino-parks all over the world. They even make noise! Cal Orck'o has been rejected in 2008 from entering the List: the IUCN considered that sites nominated on the basis of trackways alone are too narrowly focussed to be included in the World Heritage List, and that Cal Orck’o has the smallest potential out of the three trackway sites currently up for nomination (the others are in South Korea and in Spain/Portugal). They also did not like the fact that it is within an active quarry, and that the owner seems to be the cement factory. A miracle is needed to get it in – possibly in 2016 when the cement quarry will be deactivated, and more trackways (and fossils) may come to the surface. I do happen to find them quite fascinating, and I think IUCN has been too harsh in its judgement (I believe they were mainly mad because of the active quarrying by the cement factory) . In their dismissal of the Iberian Dinosaur Ichnite sites in 2010 they virtually closed the door to submissions based on trackways only. The Committee however did leave some room for further investigation and a possible serial nomination.